Blind Creations: Lighting the Grow/volution! This image shows writers Frédéric Grellier, Romain Villet, Naomi Foyle, Rod Michalko and Ryan Knighton sitting on chairs arranged in a row in front of a long computer podium. Hannah Thompson is standing behind the podium, addressing the auditorium audience. As the Greeks vote a resounding NO to austerity, here in the UK disabled activists prepare again to storm Westminster on Wednesday to protest the abolishment of the Independent Living Fund – everywhere the war on the poor is cutting deep, and people are fighting back. We living in desperate times, and yet also there’s an exciting spirit of defiance in the air. My dream is of a global grow/volution – a gradual and profound revolution, the transformation of our cruel and corrupt global economic system into one rooted in the principles of human rights and respect for difference. Gradual, because while sudden change is a great catalyst, too many radical upheavals breed insecurity and violence, while the creation of a just society requires reflection, compassion and co-operation. 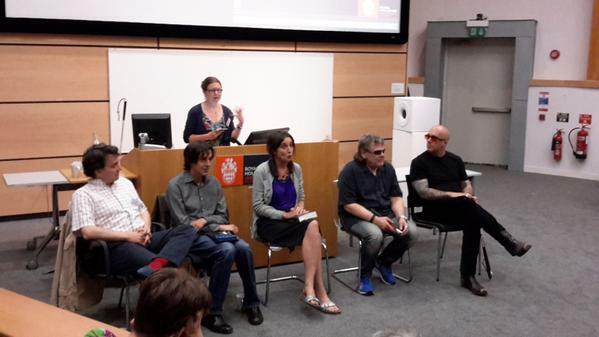 Just back from Blind Creations, a 3 day micro-arts festival and conference on the relationship between blindness and the arts, held last week at Royal Holloway University of London, I am more convinved than ever that such a world is possible. As I told organisers Hannah Thompson and Vanessa Warne, and will now officially state, Blind Creations was the best conference I’ve ever attended. The weather, food and setting certainly helped. The campus’s Founders Building, a vast feast of red brickwork and Corinthian columns, chimney crenallations, stone corbels and quoins, is set in lush woodlands, while the catering included asparagus soup and a BBQ picnic in the grassy quadrangle, with grilled haloumi and aubergine kebabs for vegetarians. All this during Mediterranean sunshine levels! Yes, ivory or red brick, the towers of academia have their perks. But privilege is there to be redistributed – check out sustainable agriculture company grovolution, who use technology first developed at NASA* – and sometimes universities, as institutions of learning and communication, do in fact provide space for real cultural exchange and change. At Blind Creations, the programming and, above all, the people involved, made this gathering a powerful opportunity for sighted people – and institutions run largely by them – to learn from the experience of blind and visually impaired people. To start with, there was a marvellous breadth of knowledge on offer. As an SF ‘world builder’, I thoroughly enjoyed the multidisciplinary approach – art, history, philosophy, literature, sociology, museum studies, media studies, film, technology, theatre, post-colonialism and linguistics were all represented. It was also exciting to be part of such an international occasion, with delegates from countries as far as India, South Korea, Japan and Brazil, while I enjoyed giving my schoolbook French an outing and – for a particular reason I will disclose in my next blog – the presence of so many Canadians gave me a happy sense of connection with the land I grew up in. But though the intellectual and geopolitical range of the conference were hugely stimulating, for me, the social atmosphere was most revelatory aspect of the experience. While student volunteers were on hand to support the visually impaired participants, on the first day Vanessa asked us all to co-create a culture of ‘support and respect’ – if a blind person needed help navigating the space, they were asked to put up a hand, and sighted people were asked to respond. I had already begun approaching blind delegates to say hi – this was no time or place to be shy – and was already discovering that the conference etiquette was an ice-breaker into warm waters. Normally at conferences I feel a degree of social awkwardness, but here the combination of shared interests, a shared journey and physical touch, infused these navigational encounters with mutual good humour, curiosity and a delicate intimacy. I felt comfortable asking for help in my guiding technique – am I giving too much info, too little? 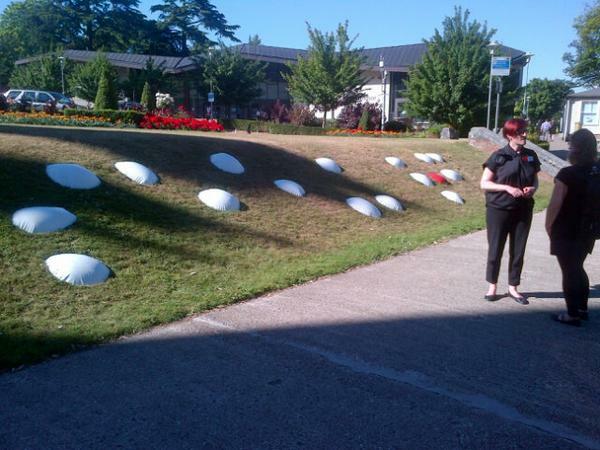 I had discussions about touch in different cultures and families; I stopped to explore my tactile environment. Conversations felt warm and personal, as did the atmosphere of the conference as a whole. Though the place was filled with experts in their fields, even celebrities, there was no sense of big egos bumping up against each other here. Rather people chatted as though we were all old friends, the conference generating a social force field perhaps akin to what blind theorist Piet Devos called ‘relational identity’ – it was interconnectivity in action, or as Canadian writer Ryan Knighton put it ‘an economy of trust’. During our plenary session, Ryan was also responsible for a quip about urinals that sent the whole auditorium into gales of laughter, a long moment of wonderful uproar I can’t recall experiencing at any other conference I’ve attended. Overall, the palpable sense of community at Blind Creations made me think about the nature of inclusion – what is gained from the active inclusion of disabled people in society is a rich and genuine sense of being stronger together, creating a world where caring for each other is not a devalued and monetised job, but a shared human experience. As plenary speaker Georgina Kleege concluded her talk: ‘when we open up the culture, we change the culture’. This, to me, is a truth at the heart of the grow/volution. Hannah blogged about the installation of this piece, but did not say what the braille phrase meant. I tried to discover online, but could not find a key to Grade 2 Contracted braille (in which some braille characters stand for syllables, not letters). I sensed that part of the point of the piece was to demonstrate inaccessibility, but nevertheless I wanted to know what was being said. Finding myself sitting next to the artist I plucked up my courage and asked him to reveal the secret. At first David said he wanted to preserve the mystery of the artwork, but when I persevered, saying how much I liked the title’s pun on ‘too big to fail’, he kindly relented and told me the phrase was ‘seeing red.’ As I replied, knowing this did not at all reduce the piece’s power to me – quite the opposite. Rather, I felt the anger expressed directly linked disability campaigners to the current crisis in Greece, making a braille-iant comment on austerity. The phrase also described the conference itself, with its goal of ‘reading’ vision, and the artist’s own vision, which he told me can sometimes be a field of red. Visual impairment, as the conference discussed, is a varied and individual experience. 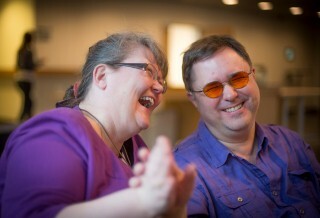 This image shows Riitta Lahtinen and Russ Palmer laughing and smiling, with their joined hands outstretched to the viewer. Readers of Rook Song will know that one of the book’s central characters is Asar, a deafblind young man with learning disabilities, who communicates by touch with his partner, carer and manager Sepsu, and is viewed as a prophet in his society. I was at the conference to talk about how I came to create Asar and the other visually impaired character in The Gaia Chronicles, Hokma Blesser. In the course of my research for Asar, I had taught a creative writing workshop at Stay Up Late, a charity that works to ensure people with learning disabilities can attend gigs, but my other research had been online, and not as detailed as I wanted. So I was thrilled to hear a presentation by the married couple Russ Palmer and Riitta Lahtinen on using social haptic communication (touch-based language) to interpret art for visually impaired people. Russ, who is deafblind with two cochneal implants, and Riitta, the Head of the Communication Unit at the Finnish Deafblind Association, later generously allowed me to ply them with questions about their work. I would have to write another whole blog post to share what I had learned, but suffice to say I am now excited about returning to Asar in Book 4, armed with a far greater knowledge of his language. This image shows a smiling Hemachandran Karah sitting outside on a chair on a lawn. Being the descendent of a nineteenth century Scottish missionary in Calcutta, and having spent time in India looking into my mother’s family history there, I was glad to meet the blind Indian delegates Aravinda Bhat, whose talk on Borges led to a shared appreciation of jokes in Finnegan’s Wake; and Hemachandran Karah, whose talk on blind Indian writer Ved Mehta I missed, but whose conversation on the last day brought me up to speed on Heidegger in India, and Kindle screenreading technology for the visually impaired. I was also very pleased to make the acquaintance of blind Indian-American scholar Sejal Sutaria, whose work on Dalit and Indigenous activist writing in India is leading her to desire an active connection with the Palestinian struggle. Overall, there was a strong post-colonial thrust to the conference that I hope can be built upon in future such events – it would be very good to hear from blind and visually impaired African and Middle Eastern speakers, or (considering their absence here) to understand what obstacles they might face in attending international events. 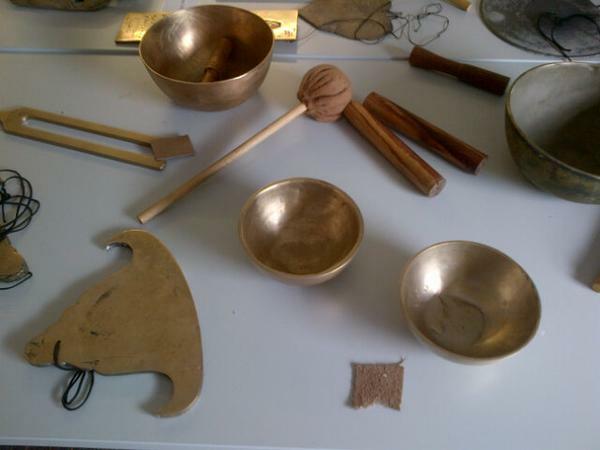 This image shows a table display of bronze bowls, wooden sticks, a cloth covered gong stick, and a flat bronze gong in a shape that resembles a bell, a Tibetan Lama’s hat, or a Buddha. Rook Song readers will also know that Asar gives his prophetic counsel accompanied by music, most significantly Himalayan singing bowls. According to legend, these are made of seven metals, including meteorite iron which the lamas believe helps meditators enter into astral travel. So it was the most marvellous serendipity to meet artist Aaron McPeake at the conference, and see and play his bronze singing bowls. Holding the bowls on my flat palm, up near my ear, Aaron teaching me how to play properly – keeping the wooden stick moving with a steady pressure and constant speed – I felt the overtones carve out their strange, calming space within me. A former stage lighting designer who has met Samuel Beckett (in a London caf; Sam was almost chirpy), Aaron lost much of his sight by 2002, provoking a move from stage lighting design into art. He also makes slate works, films, responses to Icelandic landscapes, gongs and bells all of which you can see and hear here. Due in part to significant relationships I have had with highly creative and successful blind people over the years, I do not perceive blindness as a personal catastrophe. As a fiction writer I have aimed to convey my visually characters as people with complex identities and active roles in their societies. Nevertheless, I enjoy my sight and – not even liking to lose my hat – would not welcome losing it. And one of those relationships, a difficult one with an employer, did leave me with the impression that the person’s blindness was a factor in their inability to trust other people, and concomitant need to control them. That’s an impression I am reassessing, and in any case certainly wouldn’t generalise from. As a sighted person, I know that I have far more to learn and unlearn about blindness. But the sheer happiness radiating from so many blind people I met at the conference was a powerful reminder of the truth of the refrain of Hannah Thompson’s blog Blind Spot – that blindness, far from being a tragedy, is simply another way of being in the world, and one that can offer many pleasures. At the Gala BBQ I watched David Johnson encounter, with delighted surprise, half a baked potato on his plate. Suddenly, a slightly altered phrase from Peter Pan popped into my head: ‘To be blind must be an awfully big adventure’. Tinker Bell, of course, says ‘To die’, but except in the sense that they are both experiences that many people fear, I don’t at all associate blindness with death. For a sighted person going blind is by its nature a loss, but that is not the end of the story. Any loss is also fundamentally a change. Life continues, allowing new growth, both radical and subtle, to occur. Returning from Blind Creations I am more certain than ever that should I become blind, I would adjust, and find value, pride and beauty in my new mode of being. Life, after all – as my CBT counsellor tells me – is to a large extent how you look at it. So thank you again, Hannah and Vanessa, for the tremendous and re/visionary experience of Blind Creations. *For the record, I hit on the term ‘grovolution’ as I was writing, then Googled it. I rethought my spelling, as I don’t want to infringe on copyright, or cause confusion, and in any case I like using the whole word grow rather than something snappier. Growing is usually a slow process, with breaks and reversals, hence the back slash. This entry was posted in Astra, Blindness, Disability, Mental Health, Novels, Politics, Rook Song, Uncategorized and tagged Aaron McPeake, Aravinda Bhat, David Johnson, Georgina Kleege, Hannah Thompson, Hemachandran Karah, Piet Devos, Riitta Lahtinen, Russ Palmer, Ryan Knighton, Sejal Sutaria, Vanessa Warne. Bookmark the permalink.